This recipe has an interesting background.Those were the days when I was a college pass out and joined Cognizant as Entry Level Trainee.There were not much responsibilities and I had lot of free time in my hand. I used to read several magazines and note down the recipes in a diary.This is one such recipe.My mom was out of town and my uncle paid sudden visit to our house. My mom had already prepared idli batter. So I made this sambar before they arrived and served with dosa for breakfast.After that I left for office and my uncle had his lunch in a nearby hotel (Our house was at walkable distance from a famous hotel at Adyar).He had come to a conclusion that I had bought the sambar from this hotel.Though I was upset to know that he could not believe that I can cook, in a way I was happy that my sambar was close to the sambar of a popular hotel. After all it is the recipe for Hotel Sambar! Add a little oil in a pan and fry the channa dhal, coriander seeds ,red chillies, cumin seeds, pepper, fenugreek and poppy seeds. Now add the ground masala . The recipe is very similar to vengayam arachuvita sambar. Cumin seeds and tomatoes are the additional ingredients added. hmmmmmmmmmmmm yum yum delicious and flavourful sambar. Now its 1 pm here and this makes me hungry...:(..Delicious sambar and fluffy idlis..
Aww take that as a compliment only that you could recreate the same magic..Looks delicious..
Looks extremely yumm & inviting!!! 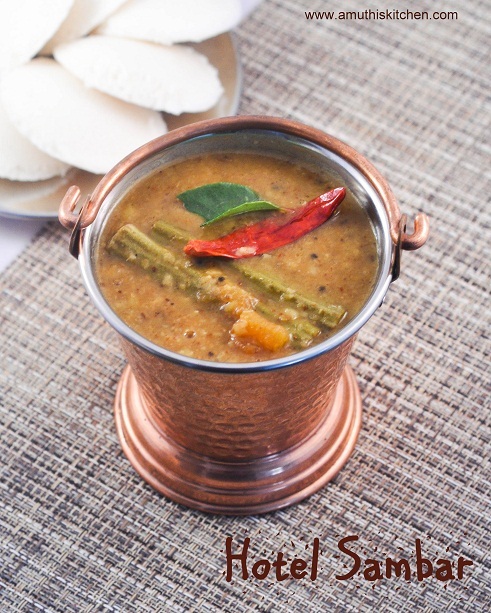 Sambar masala looks very refreshing and yummy. Nice recipe dear..sambar looks yummy n flavorful! Perfect for dosai an idlies. i can go for second serving too. I guess both carry the same meaning. In Tamil we call Arachuvita sambar or Araithu vitta sambar. how many red chillies for grinding the sambar masala we have to put? Super recipe. I like to taste sambhar from Adyar hotel too..